As Nigeria swore in Muhammadu Buhari as the new president on Friday, the Obama administration signaled that it was prepared to expand military cooperation in the fight against Boko Haram. Secretary of State John Kerry, who led the American delegation at the inauguration, discussed cooperation against Boko Haram in a short meeting on Friday with Mr. Buhari. “We certainly hope to be able to do more,” the official added. Dignitaries from more than 30 nations attended the inauguration of the 72-year-old Mr. Buhari. The ceremony, which marked Nigeria’s first transition of power from one political party to another since the end of military rule in 1999, was held in Eagle Square. Despite concern about Boko Haram, the United States’ efforts to expand military cooperation with Nigeria diminished during the presidency of Goodluck Jonathan, who was defeated in the March election. American officials expressed frustration with human rights abuses and corruption in Nigeria’s military, and Mr. Jonathan’s government complained that the United States was intervening in its internal affairs. As tensions grew, the number of American drone flights that the administration arranged to help search for the kidnapped girls dwindled, as did the number of American intelligence and security advisers sent to help Nigerian forces. The election of Mr. Buhari, a former general who has vowed to make fighting Boko Haram a priority, has created a new opportunity to increase military aid. “There was a strain in our relationship, particularly with the army on military cooperation, and we have every indication that we’ll be able to start a new chapter,” the State Department official said. In a sign that the United States was hoping to strengthen military ties, Gen. David M. Rodriguez, the head of the United States Africa Command, was among the small American delegation here. In addition to discussing military support, Mr. Kerry was expected to underscore the need to rehabilitate the young women who have been raped, and often impregnated, by Boko Haram fighters. Mr. Buhari said during his inaugural speech that he was committed to “streamlining” such programs. 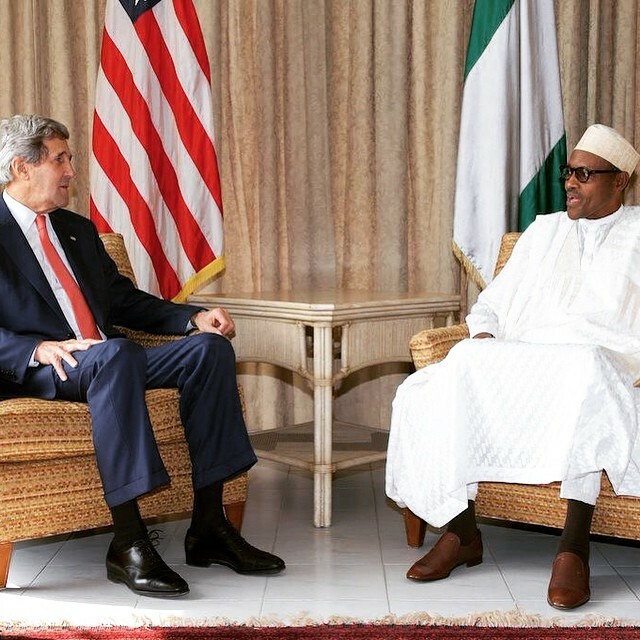 Any Nigerian units that the United States would train as part of new program with Mr. Buhari would need to be vetted to ensure that they were not linked to human rights abuses, which is a condition of providing assistance under congressionally mandated restrictions — the “Leahy laws” named after Senator Patrick J. Leahy, the Vermont Democrat. Aides to Mr. Buhari have already indicated they are prepared to cooperate in this area, the State Department official said. In addition to helping with intelligence and providing advice on how to manage military logistics, which is a challenge for the Nigerian military, the official said the United States might provide training in other areas, including administration. Boko Haram has been on the retreat in recent weeks, but continues to strike with bombings and massacres in villages, including those suspected of cooperating with Nigerian forces. Mr. Kerry’s visit was not a long one. He met with Mr. Buhari for about 15 minutes at Eagle Square after the ceremony, and was then on his way to Geneva for a meeting on Saturday with his Iranian counterpart on the nuclear talks.